Five years ago I wrote The "Why?" of 9/11, and now that the tenth anniversary of the disaster has arrived, the accuracy of that analysis has not been challenged. Nineteen Muslim fanatics committed mass murder so as to gain support from 1.5 billion other Muslims for their fundamentalist movement, by attacking the "Great Satan" which has been dissing them for sixty years by its unremitting support for the State of Israel. As a Hamas spokesman accurately said on the day itself in 2001, the attacks took place because of "US foreign policy." Tragically that policy has not changed since; nor, as my article suggested it should, has it been abandoned altogether, for the maintenance of some foreign policy is integral to government itself. Instead, in the kind of discussion permitted by the media, that vital question "Why?" is still not being addressed! That obvious answer would be too embarrassing to the holders of political power, and in the felicitous phrase of Becky Akers in Lew Rockwell last week, "politicians will wax honest before the mainstream press grows a spine." Absent government, the strong desire of Jews for a homeland could have been satisfied quite readily during the past century. Jewish mythology holds that there is a god, who created everything and "gave" land at the Eastern extreme of the Mediterranean to their particular tribe, from which it was expelled by Romans in 70 AD. It's very remarkable that Jews have been able to keep their racial and cultural identity ever since in the "Diaspora", and down the centuries they have suffered repeated persecution and occasional savage pogroms or slaughters, culminating in the awful one carried out by the government of Germany during WW-II. So it's understandable that Jews clung to their myth and wished for "next year in Jerusalem" - to get a safe haven, and in the land originally theirs. But, how? It wasn't hard. In every country where Jews have lived, they have been industrious and successful and so better-off than most of their neighbors, hence well able to afford the journey to Palestine. At any time, for example in and since 1900, they could have simply turned up in that land and settled; there was no Palestinian border control or INS to hinder their arrival; not even passports were then required. Many, in fact, did exactly that. Had more done so, they would have used their superior skills to establish a strong Jewish community there, eventually forming a prosperous and almost exclusively Jewish society - yet without forcing anyone out of their property or traditional homeland. All transactions would have been voluntary; some would have arrived offering nothing but labor, and would have been hired; some would have brought gold and would have purchased farms and businesses and houses. The skills that Jews have actually displayed and used since 1948 to transform that rather arid land into a thriving and fertile one would have been employed in very much the same way - but without aggravating any existing resident. In fact, those former Palestinians would have been enriched by the process; by voluntarily selling up, they could have enjoyed the proceeds in leisure. The profound resentment that has festered and caused all the terrorism since that year would never have begun. But governments weren't absent, and so that simple, natural, peaceful migration never took place. It's one of history's greatest tragedies. Wikipedia has an informative page about much of how instead they played politics. It recognizes Theodor Herzl as the originator of Zionism in 1896, and he clearly wrote of a perceived need for "a home for the Jewish people in Palestine secured under public law." That's another way of saying, a State. Instead of leaving it to millions of individual, sovereign Jews to decide where to live and work, he wanted other states to create a Jewish state, with "public laws" to secure their position. The idea grew, and was presented to the British government as early as 1905. By 1917, embroiled in a desperate war of its own making, that government came across with a promise, of sorts, in the "Balfour Declaration" which gave the idea support. Motives: to help persuade Jewish chemist Chaim Azriel Weizmann, later the first President of the Israeli State, to hurry through his newly-discovered process for synthesizing acetone, a vital munition; to attract support for the Allied cause from the predominantly Jewish leaders of Bolshevik Russia; and to draw in as active participants America, where Jews had also gained political clout. 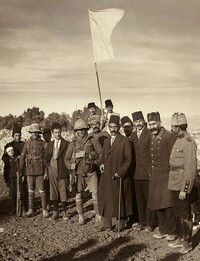 Palestine was taken by the Brits during WW-I from Ottoman Turkey, with Jerusalem shown here being surrendered; the League of Nations later gave them a "mandate" to govern the territory, so they were stuck with the Jewish problem and the promises they had at least half-given. Statist Jews took full advantage, and pressured them for fulfilment - the pressure becoming intense after the slaughter of the Holocaust. At that time (1945-47) the British government actually prevented Jews from migrating to Palestine, while negotiating to set up an Israeli state on land it did not own and despite the wishes of people who had lived there for centuries and who did own it. Jews already there had set up terror squads like the Stern Gang, one of whose members was Yitzak Shamir, later an Israeli Prime Minister, and Jews in Washington and London used all their influence to bring about the United Nations Resolution 181, which set up the State and introduced all the violent conflict of the following six decades and counting. Hence, it must be perfectly clear that instead of Palestine being an area to which individual Jews might choose to migrate on an individual basis, groups of violent thugs worldwide were setting up a state - an organisation based, as they all are, upon violence. That may not have been what all Jews wanted, but it's what the influential ones wanted. They got it; and they got the unwavering and unconditional support of US governments ever since for the Israeli State at the expense of the displaced Palestinians. Thus, the entire history of violence over six decades was created by statists; including four major Middle East wars, the aircraft hijackings and murders of the 1960s thru 80s, Lockerbie, and of course our present subject, with the massive and appalling theft of personal liberties it enabled government to commit. All of it stems from the statist creation of 1948 and the adamant refusal of the US and other governments to admit that it was a disastrous error. Did they intend to create that violence and chaos? - I don't know, and it hardly matters. Their insane, insatiable lust for power, regardless of consequences, is to blame for 9/11. Have you had enough government, yet?